In 1492 AD all Jews were forced to leave Spain. Now the Spanish Government wants them to leave Mount Zion. 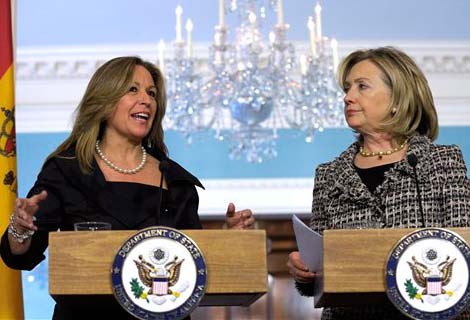 The Foreign Minister of Spain together with Hillary Clinton. A group of settlers from Hebron, led by right-wing activist Itamar Ben-Gvir, confronted Spanish Foreign Affairs Minister Trinidad Jiménez in Hebron on Tuesday. Settlers asked on Monday to meet with Jiménez when she visits Hebron in hopes of swaying her to halt her country’s support of a Palestinian construction project near the Cave of the Patriarchs. Jimenez’s two-day trip to Israel and the Palestinian territories is her first since taking office two months ago. On Monday the heads of Hebron’s Jewish community and the Kiryat Arba settlement sent a letter to Jiménez and asked for an opportunity to present her with information regarding the dangers the apartment project poses to the city’s Jewish residents, because it is likely to host released prisoners. They reminded Jiménez that her country had expelled its Jews 500 years ago, some of whom had made their way to this ancient Biblical city. “Does the Spanish government intend to contribute to an additional expulsion of Jews from Hebron?” they wanted to know. All hell bound Roman Catholics will persecute Jews till the day they will find them selves in the eternal fire. Roman Catholics in Spain included. They have never stopped mocking God, twisting the gospel and harming the Jewish people and after 1948 the state of Israel. They are the very reason why thousands of Jews simply can not believe that Jesus is the Messiah. The Roman “copy cat Jesus” is not the Messiah, but a false god, the very anti-Christ. Promoted by idol worshipers. What they have done, was predicted by the true Jesus, our Messiah and Master.